So many little things draw me back to childhood and my most dear memories, like the taste of a tomato, picked from the vine on a warm summer day in my grandmother’s garden and eaten out of hand. A tomato feels like the epitome of summer when everything I’ve worked for is rewarded. If we are lucky, tomato season in our region stretches into late October, but come January it is barely a warm and distant recollection. So it is no wonder that by February I am craving the sweet taste of tomatoes. I began growing tomatoes in earnest when I had sufficient space to grow many, and I mean many, varieties of tomato. Even on a small city plot, I grow as many as 15 or so different tomatoes. I began my tomato growing with seeds purchased from several seed catalogs and, although I have not purchased any new seed for at least ten years, I have purchased plants on occasion to try a new variety. Tomato seed has an incredible viability—I have seeds more than 15 years old that still sprout! Now I save seed (seed-saving tips to come in September) from tomatoes that I grow, and from those I have purchased at farm markets. This is where good record-keeping comes in handy (a whole other post!). Tomatoes that don’t perform well or are just so-so do not get a second chance with me. I also tend to favor non-determinate varieties (they just keep growing!). 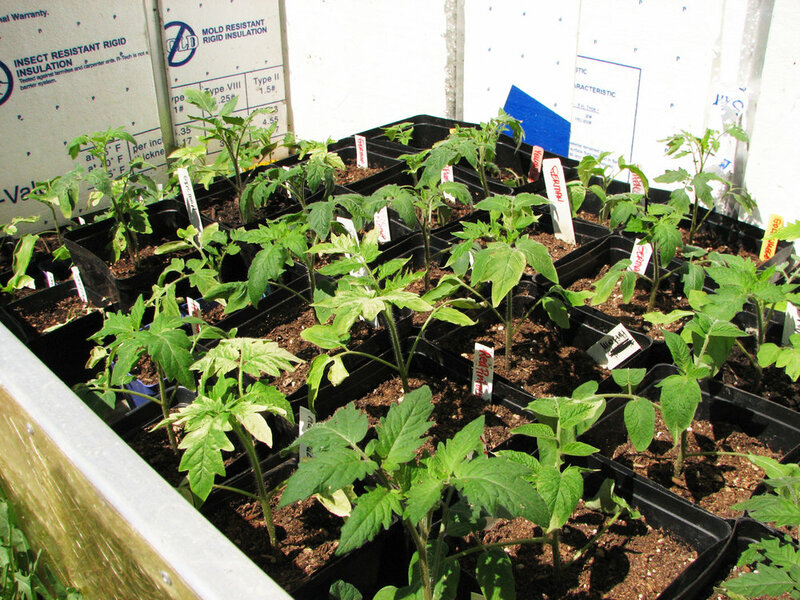 Seed saved from hybrid varieties will not grow true, but that does not mean you can’t have a good tomato. I must have more than thirty varieties by now, but hardly enough room to grow them all. I typically plant 2-3 of each variety and give away any extra plants. A few of my favorites: Heirloom German; Aunt Ruby’s Green; Jaune Flamée; Black Prince; Nebraska Wedding; Berkley Tie-Dye; Porkchop; Old Flame; Sungold Cherry; Yellow Pear; and Japanese Black Trifle. I typically start tomato seed (along with pepper seed) sometime in the first two weeks of March, but have started them as early as February (too early) and as late as April 10th (about the absolute latest, so there is still time). This year I started seed on March 17. At least half of the seed was sprouting after 5 days, but average germination is probably 7-10 days. By the second week, the true leaves are beginning to develop and after nearly a month, it will be time to transplant into 4” pots. To start seeds, I use seed-starting mix, six-packs and a lot of light. Seeds and seedlings need lots of light to get going and growing—about 18 hours a day. I have two inexpensive shop lights fitted with warm and cool fluorescent bulbs that hang above a small table in my dining room. (I have never used a warming mat, although that would be good for peppers, as they are more fussy about germination temperature than tomatoes.) The lights are on a timer that runs from 5:30 am to 11 pm. I suspend the lights with some chain and tie wire to control the distance of the lights from the seedlings, kept about one inch above the seedlings so they do not become rangy. With luck, by the end of April the starts are ready for quart-size pots and the cold frame. Tomatoes really need temperatures to be reliably above 50° before putting into the ground, and around here that is, with luck, the first of June. In my little corner of West Seattle, when the fava beans are ready to pick, the tomatoes can go into the ground. My preparation of the planting bed begins when the fava bean plants come out, and I add compost, chicken manure and a little bit of organic vegetable fertilizer to the soil. I grow tomatoes quite close together and train them up an 4’ x 8’ trellis of concrete reinforcing mat, staked with 10 ft. rebar. Dig a hole at deeper than the pot the plant came from and plant up to the first leaves. At this point, I relinquish all care except weeding to the "groundskeeper," my husband. He would recommend weekly pruning or pinching out the little sucker leaves along the main stem, as they are non-fruiting and use energy better spent on tomato development. Regular watering is also key to help prevent blossom end rot. Experimentation over many years is the only way to sort out what works. 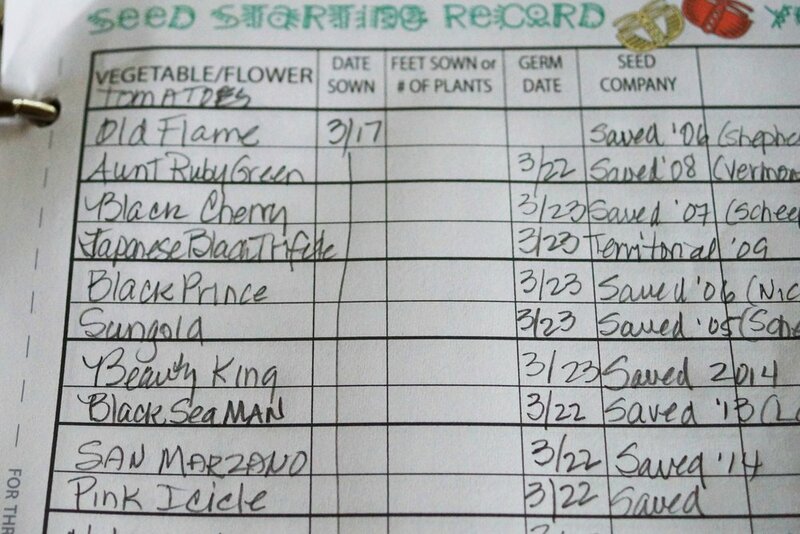 Record-keeping helps, as does reading about the experiences of other obsessive gardeners. The promise of the first tomato of summer is just 4 months away! In the meantime, fava beans and peas will have to satisfy the early summer cravings.